Caché SQL, Caché MVBasic, and Caché Basic also provide commands for working with locks. For details, see the Caché SQL Reference, the Caché MultiValue Basic Reference, and the Caché Basic Reference. Also, the %Persistent class provides a way to control concurrent access to objects, namely, the concurrency argument to %OpenId() and other methods of this class. These methods ultimately use the ObjectScript LOCK command, which is discussed in this article. All persistent objects inherit these methods. See Object Concurrency in Using Caché Objects. Similarly, the system automatically performs locking on INSERT, UPDATE, and DELETE operations (unless you specify the %NOLOCK keyword). Process A issues the LOCK command, and Caché creates a lock (by default, an exclusive lock). Formally, lock names follow the same naming conventions as local variables and global variables, as described in the chapter Variables in Using Caché ObjectScript. Like variables, lock names are case-sensitive and can have subscripts. Do not use process-private global names as lock names (you would not need such a lock anyway because by definition only one process can access such a global). The form of the lock name has an effect on performance, because of how Caché allocates and manages memory. Locking is optimized for lock names that use subscripts. An example is ^sample.person(id). In contrast, Caché is not optimized for lock names such as ^name_concatenated_identifier. Non-subscripted lock names can also cause performance problems related to ECP. Caché maintains a system-wide, in-memory table that records all current locks and the processes that have own them. This table  the lock table  is accessible via the Management Portal, where you can view the locks and (in rare cases, if needed) remove them. Note that any given process can own multiple locks, with different lock names (or even multiple locks with the same lock name). The Caché lock queuing algorithm queues all locks for the same lock name in the order received, even when there is no direct resource contention. For an example and details, see Queuing of Array Node Locks in the chapter Lock Management of Using Caché ObjectScript. Where lockname is the literal lock name. The plus sign (+) creates an incremental lock, which is the common scenario; see Creating Simple Locks for a less common alternative. Where timeout is the timeout period in seconds. The space before the colon is optional. If you specify timeout as 0, Caché makes one attempt to add the lock (but see the note, below). Sets the value of the $TEST special variable. If the lock is acquired, Caché sets $TEST equal to 1. Otherwise, Caché sets $TEST equal to 0. As noted above, if you specify timeout as 0, Caché makes one attempt to add the lock. However, if you try to take a lock on a parent node using a zero timeout, and you already have a lock on a child node, the zero timeout is ignored and there is an internal 1 second timeout, which is used instead. Where locktype is a string of lock type codes; see the later section Lock Types. The lock type codes do not have to be in the same order as when the lock was created. The lock type codes D and I have special behavior in transactions. For details, see LOCK in the Caché ObjectScript Reference. You cannot use these two lock type codes at the same time for the same lock name. You can create escalating locks only for lock names that include subscripts. If you attempt to create an escalating lock with a lock name that has no subscript, Caché issues a <COMMAND> error. For details on immediate unlock and deferred unlock, see LOCK in the Caché ObjectScript Reference. You cannot use these two lock type codes at the same time for the same lock name. When a given process has created more than a specific number (by default, 1000) of escalating locks at a given subscript level in the same array, Caché removes all the individual lock names and replaces them with a new lock. The new lock is at the parent level, which means that this entire branch of the array is implicitly locked. The example (shown next) demonstrates this. Your application should release locks for specific child nodes as soon as it is suitable to do so (exactly as with non-escalating locks). As you release locks, Caché decrements the corresponding lock count. When your application removes enough locks, Caché removes the lock on the parent node. The second subsection shows an example. For information on specifying the lock threshold (which by default is 1000), see LockThreshold in the Caché Parameter File Reference. Notice the entries for process 8788. The ModeCount column indicates that these are shared, escalating locks. There is a subtle point to consider, related to the preceding discussion. It is possible for an application to release locks on array nodes that were never locked in the first place, thus resulting in an inaccurate lock count for the escalated lock  and possibly releasing the escalated lock before it is desirable to do so. For example, suppose that the process locked nodes in ^MyGlobal("sales","EU",salesdate) for the years 2010 through the present. This would create more than 1000 locks and this lock would be escalated, as planned. Suppose that a bug in the application removes locks for the nodes for the year 1970. Caché would permit this action, even though those nodes were not previously locked, and Caché would decrement the lock count by 365. The resulting lock count would not be an accurate count of the desired locks. If the application then removed locks for other years, the escalated lock could potentially be removed unexpectedly early. 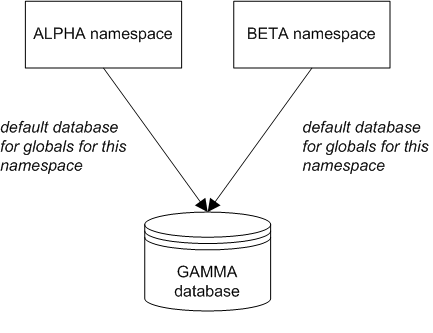 Any namespace has a default database which contains data for persistent classes and any additional globals; this is the global database for this namespace. When you access data (in any manner), Caché retrieves it from this database unless other considerations apply. 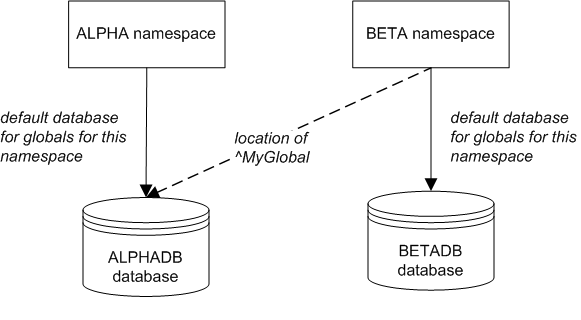 A given database can be the global database for more than one namespace. See Scenario 1. Although lock names are intrinsically arbitrary, when you use a lock name that starts with a caret (^), Caché provides special behavior appropriate for these scenarios. The following subsections give the details. For simplicity, only exclusive locks are discussed; the logic is similar for shared locks. If one or more namespaces include global mappings, the system automatically enforces the lock mechanism across the applicable namespaces. Caché automatically creates additional lock table entries when locks are acquired in the non-default namespace. If one or more namespaces include global mappings that use subscript level mappings, the system automatically enforces the lock mechanism across the applicable namespaces. In this case, Caché also automatically creates additional lock table entries when locks are acquired in a non-default namespace. As with the previous scenario, the lock table contains only the entry for the lock owned by Process A. This lock applies to the ALPHADB database (C:\InterSystems\Cache\mgr\alphadb, for example). When a non-default namespace acquires a lock, the overall behavior is the same, but Caché handles the details slightly differently. Suppose that in namespace BETA, a process acquires a lock with the name ^MyGlobal(15). 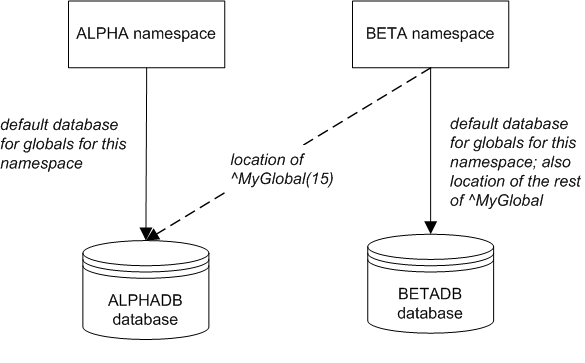 In this case, the lock table contains two entries, one for the ALPHADB database and one for the BETADB database. Both locks are owned by the process in namespace BETA. Code running in one namespace can use an extended reference to access a global not otherwise available in this namespace. In this case, Caché adds an entry to the lock table that affects the relevant database. The lock is owned by the process that created it. For example, consider the following scenario. For simplicity, there are no global mappings in this scenario. A process-private global is technically a kind of extended reference, but Caché does not support using a process-private global names as lock names; you would not need such a lock anyway because by definition only one process can access such a global. 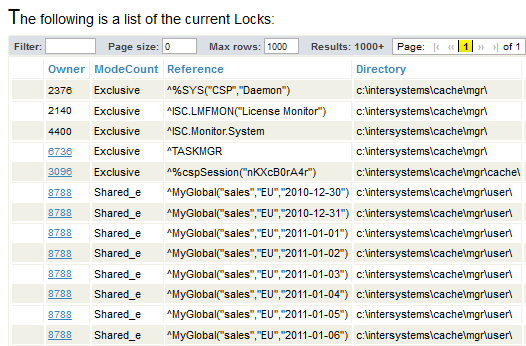 If a deadlock occurs, you can resolve it by using the Management Portal or the ^LOCKTAB routine. See Monitoring Locks in the Caché Monitoring Guide.